Sharing life lessons learned while striving to follow the Lord's call in spite of the chaotic lives we lead. Why I Can't Wait to Go to Confession Next Week! The very best reconciliation experience I have ever had just happened to me recently. Now when I say the BEST allow me to put this into perspective for you. I mean the best experience I have had from years of many good ones including some amazing confession experiences when on retreats, to confessions with a wonderful spiritual director I had for several years. So I am not new to pleasing reconciliation experiences. I guess that is the funny thing about us as humans. Now that I think about it, over the last few decades of going to confession, I have had so many great confessional experiences yet the one that really made me question whether to return or not was the one and only (so far) bad experience I had a few years ago. It always seems that the negative experiences outweigh the positive, that the bad memories are recalled more often than the good. How strange we humans are! Anyway, I digress. Back to my original story. Preparing for this Lenten season I wanted to be ready to receive and share whatever graces with which the Lord is willing to bless me. Therefore, I thought what better preparation than to begin with a clean slate? So I again mustered the courage (yes I still have to muster it b/c of my previously bad experience)to head on over to confession early one Saturday morning. Now there were a million and a half reasons NOT to go to confession that morning. One, it was so cold outside and I just wanted to stay in my pjs in the nice warm house and snuggle with my kids. Two, the time confession was to start my son was still nursing. Three, by the time I arrived there was a LONG line for the confessional. I debated leaving and returning another time when it was less busy. But I knew in my heart all of these things were just reasons I was creating to postpone my need to walk into that confessional door and ever so humbly lay out my sins to the world (or at least to the priest and Jesus). So, I did it anyway! It's not like I had these terrible sins to confess. I mean, I'm pretty sure, most people who went into the confessional that day said the same sorts of things. But there I was once again, waiting, anxiously fearfully waiting. Waiting for what? Judgment. THAT'S why we dislike confession so much I think. We humbly hang our heads in shame in front of that privacy screen or for the very brave, sitting across from the priest, and wait for the judgment that is to inevitably come upon us. The irony is that am I so fearful of the judgment here on earth but think so little of the judgment that will most definitely come upon me in the next life! I mean seriously, who wants to see the face of God with a mortal sin on their souls, but telling a priest how I yelled at my husband and lost patience with my kids seems too much to emotionally bare? Sheesh, I HAVE to put this confession thing into perspective! Eventually my turn in line came and I took the long walk down the hall to the confessional. Dead man walking! yelled a voice in my mind. I turned the knob and pushed open the heaviest door I'd ever had to open. Seriously, what did they make this door out of, steel? I knelt down. Screech, bang, click! Was that a jail cell or the confessional door closing? Out of breath and with sweaty palms, I launched into "Forgive me father for I have sinned...". Oh my gosh, did my voice just crack? Quickly, quickly like pulling a band-aid off skin. Let's get this pain over with. And before I knew it, I has shared all my offenses. Whew! Surprisingly, the priest did not scream and run from the room in terror, nor did he begin to bless me with holy water and in the name of Jesus Christ "compel" me. Ever so softly and sweetly, this tender confessor encouraged me on my faith journey, counseled me on other ways to handle various situations, absolved me from my sins, blessed me, and told me to "go in peace". Wow, it was over! Sweet relief! Then the most extraodinary thing happened. He thanked me. The priest thanked ME for coming to confession! He was truly GRATEFUL that I came that day to the confessional to reunite myself with Christ. This priest, who was already running almost 15 mins late from all the confessions previously heard, took the time to THANK ME! Of course, I started to cry! And no the irony does not escape me that both my worst and best reconciliation experiences ended in tears. It was an amazing moment b/c I finally realized something. After all these years of going to confession, I finally understood something that I never even thought about before. Not only do I receive the amazing graces the Lord bestows on me during this beautiful sacrament, but so does the priest if he is open to receiving this grace. We both are ACTIVE participants and therefore also RECIPIENTS of this grace! Yes, he is here to judge me with the Lord's prudence, compassion and love, but he also receives the fruitfulness that comes from me being present confessing my sins. Together we are helping each other become more Christ-like! I never thought of confession this way. I saw it as something I must do to repair my relationship with God. But what if I didn't go? What if NO ONE went? How could our earthly shepherds, our priests, fulfill their vocations? I single handedly (well maybe not single handedly since it takes more than just me), am helping this priest fulfill his duties here on earth. I am not only receiving pardon and peace but I'm granting him to opportunity to GIVE pardon and peace to another; to fill the need to lead others to the Lord. I was as light as a feather and as happy as a clam (which I suppose must be really happy because many people use this expression)! I jumped up and opened that door with one hand. Whoa! That door was so light it almost got away from me. What was it made of, styrofoam? I was joyous. Deeply emotional, yes. But joyous none the less. I practically skipped to my car. All is right with the world! I have been forgiven AND I have been thanked which means I have been valued. Dare I say it? I do indeed dare. I can't wait to go to confession next week!!!! 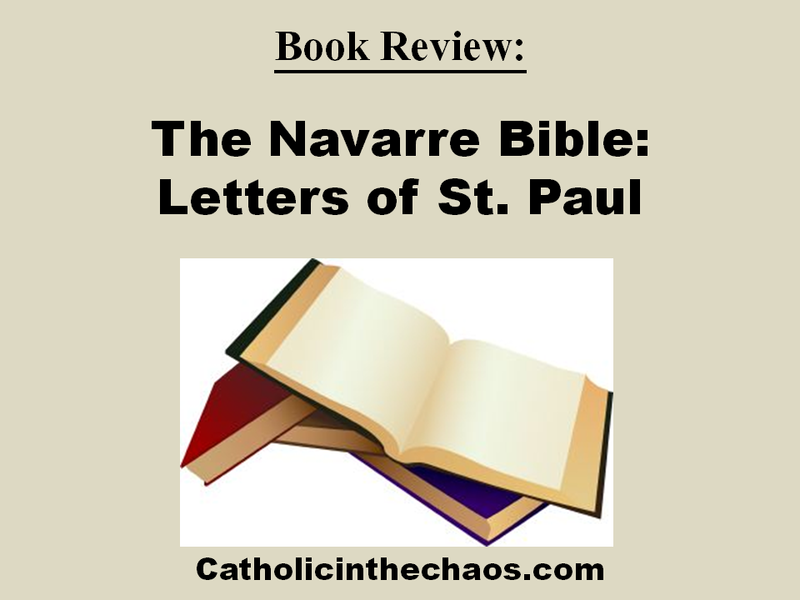 I stumbled upon this set of books called The Naverre Bible when I was searching for some type of more in depth study of St. Paul's letter to the Romans. I was so pleasantly surprised to find this WONDERFUL gem out there on amazon.com. The Naverre Bible series is an amazing series of books that take each book of the Catholic bible apart chapter by chapter and verse by verse adding important historical, linguistic and cultural information in order for a more complete Catholic understanding of the bible. Each book is a long-term study in and of itself. I'm only about a fourth of the way through the Letters of St. Paul book of this series and have learned SO SO much about the letters to Romans that I feel, I am looking at this book of the bible with new eyes. One of the greatest things about these books is that they are written by a wonderful group of theologians who understand how to present the religious, anthropological, sociological, and linguistic information which directly affect our understanding of the bible in an easily accessible manner for anyone who reads it. I can't believe the luck with which I found this book series. I am looking forward to continuing my lifelong study of scriptures using this amazing book series! I give it: 5 "Chaotic" stars! 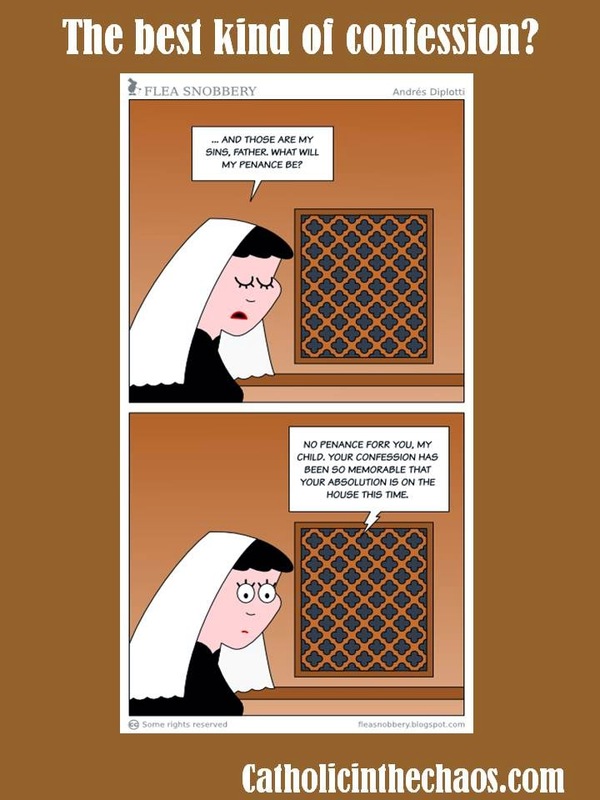 Why I Vowed NEVER to Return to Confession! I grew up in a household where going to confession every other weekend was the norm. Every other Saturday, my family of 9 (minus my mother who boycotts such Catholic “events”), would hop into the station wagon (the golden age before “the minivan”) and we headed to church to confess all the things we had done over the last 14 days. The great thing about growing up going to confession all the time is that I never felt the nervous anxiety people say they feel about going to confession. I didn’t even know that most people didn’t go to confession every other week. In fact, I was actually surprised to learn that we only are required to go to confession, ONCE a YEAR (unless our soul is in mortal danger). Say what???? 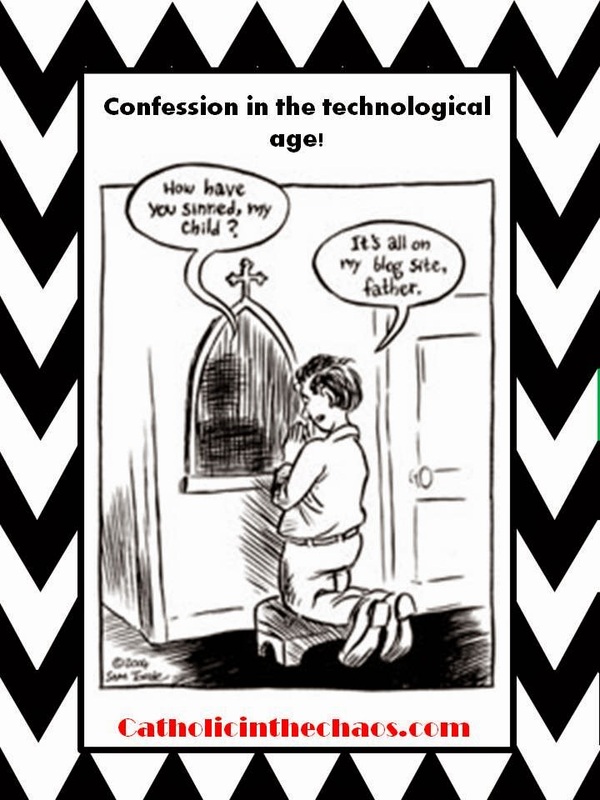 In college, I thought I would “stick it to my parents” by only going to confession once a month. Ha! Take that, suckas! But once I began that slippery slope of allowing myself to slack on going to confession, I found myself, as I got older and older, making excuses not go to confession and easily fell into the trap of waiting several months between partaking in the sacrament of reconciliation. Again, I didn’t think much of it because, well hey, I was going way more often than we are “required” to go so I must be doing alright. Then it happened. The traumatic experience EVERYONE fears will happen in the confessional, happened to ME! Only a handful of people actually know this story, so…you won’t tell anyone will you (wink, wink)? A while back, after a wonderful Lenten season and lots of prayer on my part in preparation for Easter, I was energized and on fire from the Holy Spirit. I was turning over a new leaf. No more waiting a few months before heading to that wonderful sacrament of reconciliation. No more excuses. “I’m definitely going once a month if not every 3 weeks” I promised myself. Why not go? I feel so GREAT afterwards. I mean my sins are forgiven. FORIGIVEN! Not just forgotten, not just set aside. NO FORGIVEN. The slate is wiped clean and I am as fresh as the morning dew and sweet as the smell of a baby’s bottom (well clean bottom that is). Heck yeah! Let’s get my confession on, people!! So a week or two after Easter, I found myself in the confessional on a lazy weekday morning. There was no line. No one was knocking down the door of the confessional to get in. It was just me, the priest and Jesus. Ah! It is gonna be a great day, I thought. I began ”Forgive me Father for I have sinned! It’s been three weeks since my last confession…”. Here I went, confessing my struggles over the past 21 days. I’m feeling good. This is going well I tell myself. Why would I ever not want to go to confession? and I’ll never let myself wait so long again I drone on in my head. All these great feelings running through me as I am confessing when it happened. “Hmph, ARE YOU GOING TO CONFESS YOUR SINS SOMETIME TODAY?” was shouted at me from the other side of the privacy screen. I stopped, frozen with fear. Within milliseconds I think, Did…uh…did that just happen? Did the priest just interrupt me confessing my sins to yell at me for…NOT confessing my sins? Oh NO HE DIDN’T! Righteous anger came over me (as least I thought it was righteous). I sighed and shouted right back “GEEZ!” Ok, ok, so it was not the best come back in the world. But really, he was just LUCKY other words didn’t come flying out because boy was my brain fighting to keep them contained. With my hands shaking from anger (and, let's be honest, a bit of fear), I went on and quickly finished my confession. I know what you are thinking, Why the heck didn’t you just walk out? Well the truth of the matter is that all this occurred probably within less than 10 seconds from start to finish of my confession (you better believe I said that act of contrition so fast his head was probably spinning). I was just so shocked that it happened at all and it took all of my effort not to yell at this priest (my parents taught me well), that I just stayed and went through the motions I suppose. Hey, nobody is ever going to accuse me of being quick thinking in a crisis, that’s for sure. As soon as I heard the words “Go in peace” I booked it out of that confessional, ran out of the church and got into my car faster than I’d probably moved in a long time. I cried and cried all the way home, coming up with some very clever quips I told myself I should have said, along the way. Oh I’m so witty after the fact! I was devastated. I couldn’t believe I got yelled at by a priest! In confession. For not confessing…fast enough? I felt like a child being scolded by her parents. I vowed to NEVER go back to confession again! Never again would I let someone talk to me like that when I was at most vulnerable! I didn’t want to feel alone in my anger and disappointment. So I went to the closest "most reliable" (ha!) source to find others who have been in my shoes. I scoured the internet and read stories of people who had horrific, terrifying, traumatic reconciliation experiences and never returned to receive the sacrament in 10, 20, even some 30 years later. So many stories! So many people hurt at a time they are sharing all of themselves, the good, the bad and the ugly. So many people pushed away from the Lord! My head was spinning and my heart was broken for them because they never received the sacrament again (at the point they wrote those stories on the internet at least). Then it hit me, like a cold wind smacking me in the face on an icy cold winter morning! Could I NEVER go back to confession? Could I NEVER receive this wonderful, blessed sacrament again just because of one man who either was having a bad day or was just a plain ol' flawed human being and a bad confessor? Just the thought of never feeling that wondrous feeling I get after receiving the sacrament, the feeling of a weight lifted off my shoulders, the feeling as if I am lighter than air, made me stop in my metaphorical tracks. No I could never deny Jesus the relationship He so desperately wants with me. And that includes asking for forgiveness and being pardoned for my sins. So, I decided I would work on building up the courage to go again “sometime” in the future. In the meantime, I prayed for the priest that he also learned a lesson in the confessional that day and would show others a compassion and understanding he did not show me. I still pray for him to this day whenever this story comes to my mind. To be perfectly honest, it took me several months before I could show my face in a confessional again and no I never returned to confession with that priest. But those feelings of fear, disappointment, and humiliation have not gone away. Yes they have lessened a bit but are still all too present. If I just think about going to confession, I get butterflies in my stomach. I finally understand the feelings of anxiety people have about confession. In retrospect and after much time processing this situation, I do believe that the devil was at work that day (yes even in a church, I think he tries desperately to be at work). I believe this experience was one way in which he hopes that I would cease going to confession. Sadly for him, I have not and will not ever give in! To those of you out there who have had an awful reconciliation experience, I want to let you know that I’ve been there. I know how it feels to be humiliated at the moment you are at your most vulnerable. But I ask you to never let one human being stop you from improving your relationship with Christ. 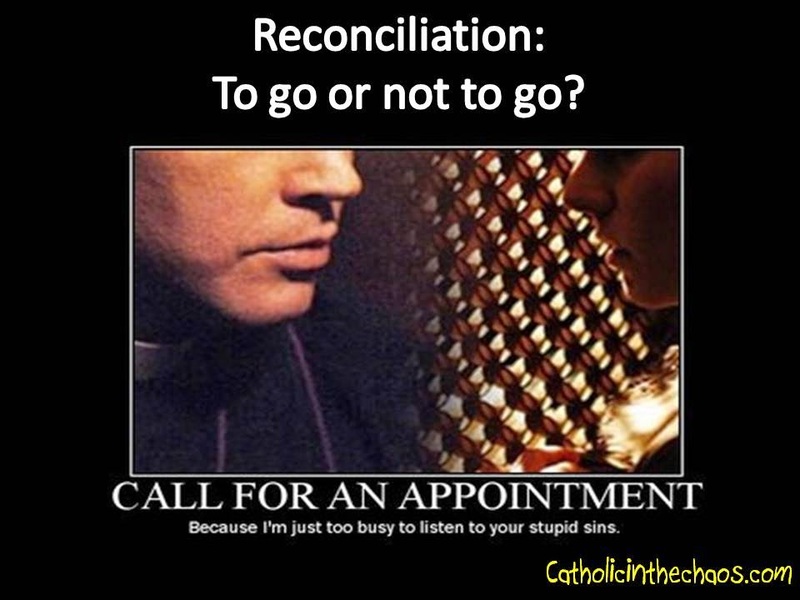 Thwart the devil’s plan by saying “yes” once again to the sacrament of reconciliation. I promise you, the feeling you get after receiving the sacrament is so worth it! To any clergy out there reading this I just want to say “Be kind”. Yes you have many, many duties. Yes you are tired and have to look forward to hundreds or thousands of confessions this Lenten season. But please, please, be careful with your words as you have our hearts, minds, and souls (truly) at your disposal. You don’t know what anxiety, fear and stress we had to conquer just to walk through that confessional door! Do NOT push us away from the sacrament of reconciliation. Just be Christ to us! After all this serious talk, I thought I'd share this picture to lighten things up a little! P.S. It’s not all gloom and doom. Soon I shall share with you my very BEST confession experience (which has just happened recently), so stay tuned and look for that in the next few weeks. This book written by Joseph Ratzinger, before he became Pope Benedict XVIth, explores how the culture of moral relativism is affecting Christianity. Although, this book was written some years ago, it is still very appropriate for today's world as well. When struggling with all the grays in the world, knowing Mother Church has it all figured out long before we even begin to ask the questions is quite reassuring. However, how do we face the confusion and questions that are brought up in this morally relativistic world? This book addresses this very thing! A review on google.com quotes this work with: "Unable to recognize God's existence or objective truth, morality is consequently reduced to a relative concept, leading to a 'confused ideology of freedom that leads to dogmatism' and ultimately 'to the self-destruction of freedom,' says Pope Benedict". Christianity and the Crisis of Cultures is an fairly short book and an easy read for the lay person. There is no difficult dogmatic information to digest. Simply understanding where our culture is being led astray via relativism is it's goal and it is achieved well in my opinion. I give it: 4 "Chaotic" Stars! I'm sharing this only a few days early in case you are still looking for some quick St. Valentine's day ideas. Sorry I wanted to get this up last week but time got away from me. So what is this chaotic family doing to celebrate St. Valentine's day/week? Check it out! 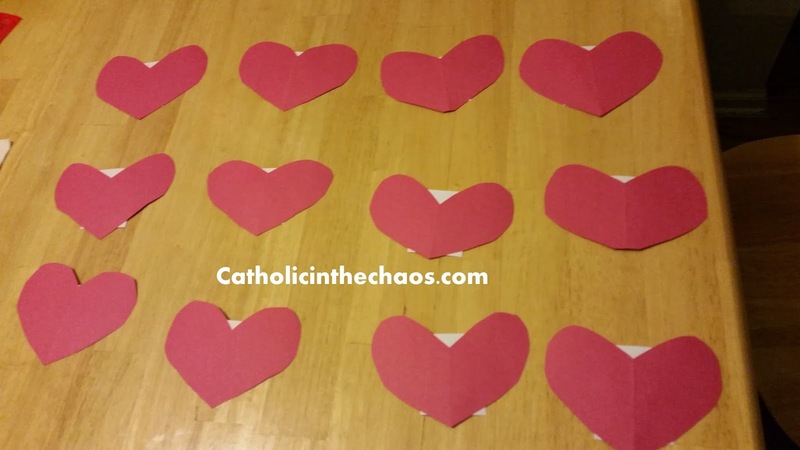 This year, St. Valentine's day is all about God's love for us. 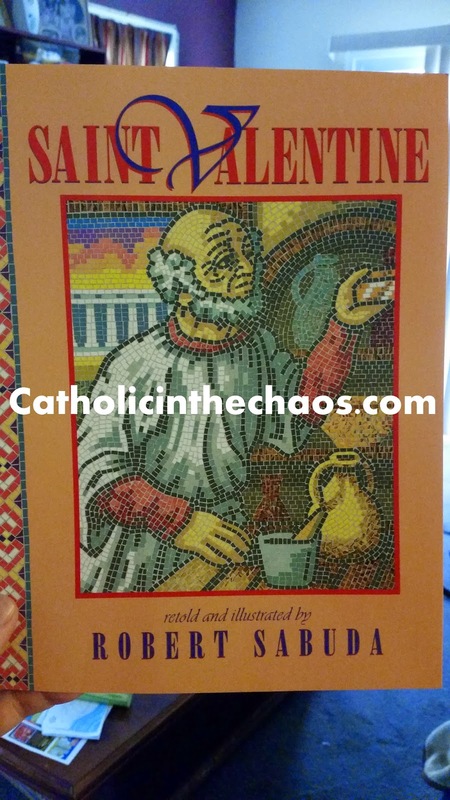 We started with the story of St. Valentine (I purchased this on amazon for less than $7...woot, woot!). It's a nice book to discuss the history of St. Valentine's day and where all this "fun" comes from. 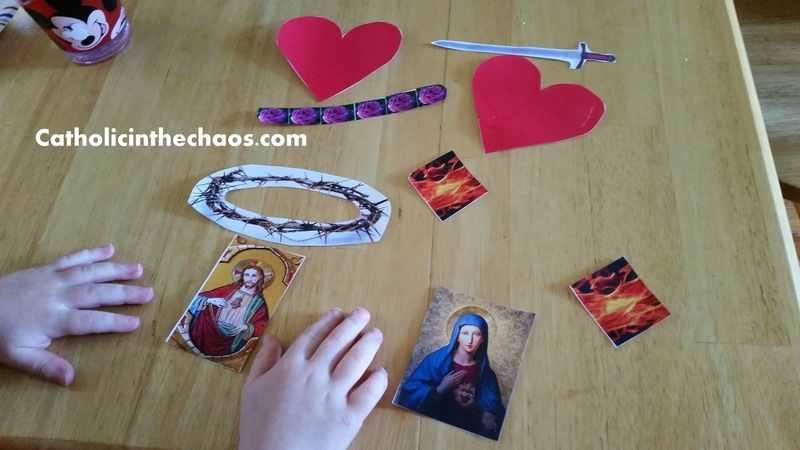 I also made an easy St. Valentine's Day memory game for my son. I simply went to google images and copied and pasted pictures of images associated with Christ's love: the Sacred Heart of Jesus, the Immaculate Heart of Mary, St. Valentine, Blessed Mother Theresa, the Holy Spirit and our family's patron saint this year, St. Angela Merici (if you missed that blog post you can find out all about her here), into a table I created in microsoft powerpoint. I find it's much easier to deal with pictures when I work in ppt. Note: Because I couldn't find these pictures under public domain I do not have the rights to public reproduction and therefore cannot share this memory game with you. Good news though, you can simply head on over to google images, type in what you are looking for and copy and paste to create your own memory game. Be sure to tailor it to your family! We talked a little bit about what each picture meant and why they were chosen for our St. Valentine's day puzzle. 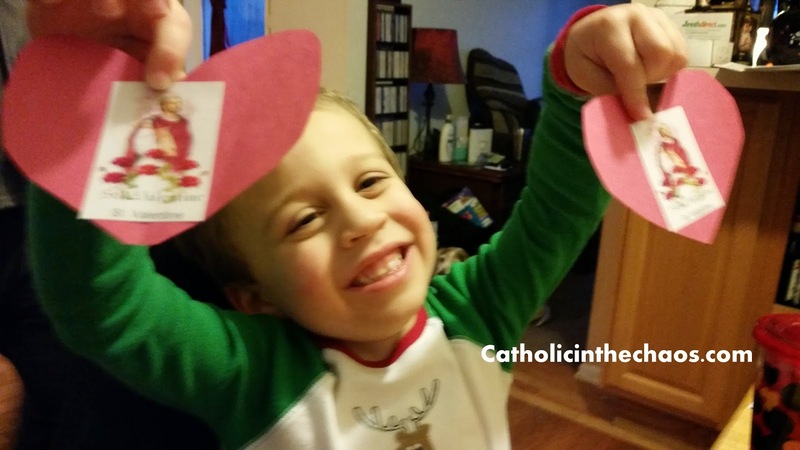 Then I cut out the pictures, glued them to the backs of some construction paper hearts and we played memory! 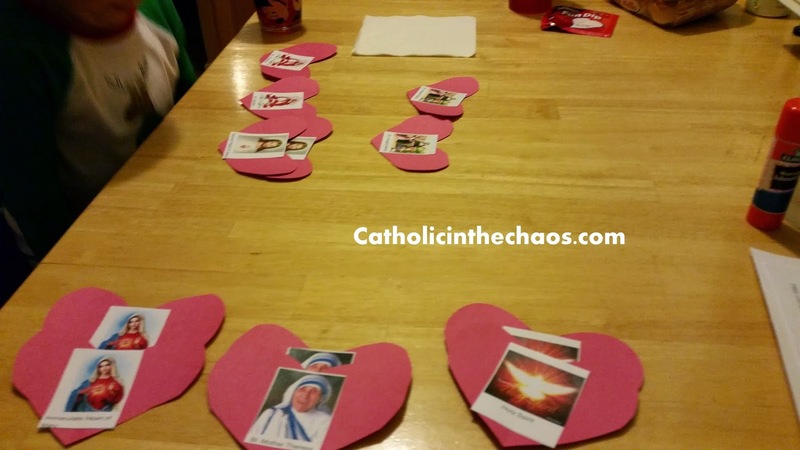 Simple game twist: the player who finds St. Valentine's match wins the game. It's a race to the finish line! THIS I can share with you as I made it in ppt with clip art pictures from Microsoft. So if you want a copy be sure to click the link below for your copy. 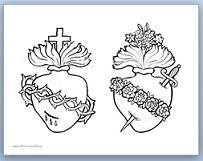 Again, I just went into power point and used the clip art they had there to make all the symbols my son would need to assemble the Sacred Heart of Jesus and the Immaculate Heart of Mary. See the pictures below of assembly! Oh I also added a page that explained the symbols and what they represent so if you choose to make this with your own children you'll be able to share the meaning of each heart! Want to do this DIY craft? GRAB IT HERE! Here are the pictures of our DIY craft! Don't have time for a craft or want to do a little bit more? 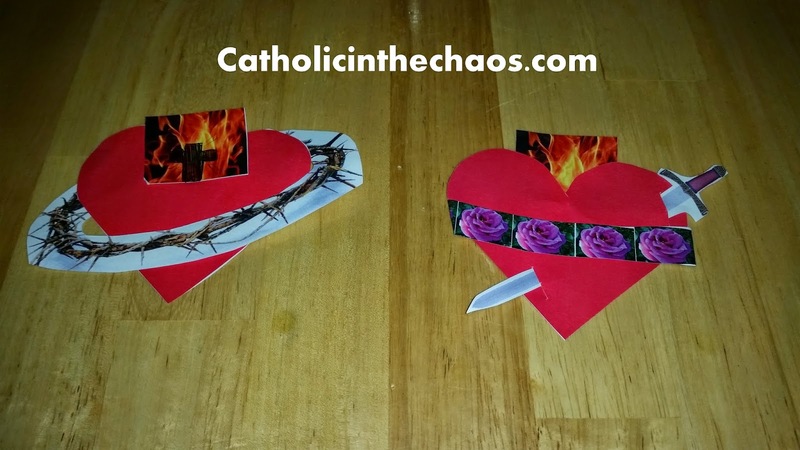 Well over at Catholic Inspired there is an AWESOME coloring page and craft you can do for the Sacred Heart of Jesus and Immaculate Heart of Mary. If you are not already a member you may have to register to become one to print these goodies off but don't fear. It's FREE and easy to do!!! We also took advantage of the wonderful coloring sheets that Catholic Playground offers for free! They have two wonderful coloring sheets for St. Valentine at the link above. Scroll down the find them at the bottom of the page. Note: Do not attempt to color print out these sheets below as they will be much too small and distorted to color. I just added them to this post so you could have a visual of what you were looking for at Catholic Playground. So these are just some ideas of how we are celebrating St. Valentine's week! Don't worry, we will still be enjoying some heart shaped cookies and pancakes and we are definitely going to exchange some St. Valentine's cards! What are your St. Valentine's ideas? 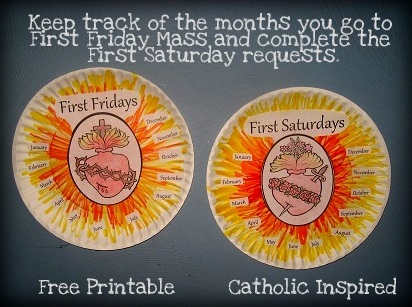 Did you do the DIY craft or color the page from Catholic Inspired? Comment below! As we prepare ourselves for the beginning of Lent next week, I have been searching for new ways to connect with Jesus on His way to the cross this season. I am reminded of the power of fasting. When thinking of Lent, we think about the one thing we are planning on “giving up” for those 40 days (with the exception of Sundays if you use it as your “cheat day”). Many people talk about giving up chocolate, or soda pop, junk food or desserts. It always seems to coincide with the idea of “getting healthy” which, to me, makes perfect sense. We want to get closer to the Lord, clear our lives of all the “junk” that pulls us away from loving Him. This includes getting rid of the “junk” we put into our bodies and turning ourselves once again into the “temple” it is truly meant to be. Although refraining from a food item or behavior is a good way to remember Christ throughout the little daily inconveniences of the Lenten season, I was wondering if there is something more I could do. Is there more I could “give”? And then I was reminded of what Jesus did immediately after being baptized by John the Baptist and prior to beginning His ministry. He headed to the dessert. He spent 40 days alone, in prayer, fasting, preparing Himself for the physical and emotional toll His ministry (especially the end of it here on earth) would take on Him. And what happens during this time in the dessert? He encounters Satan waiting for Jesus to be at His most exhausted, most lonely, most hungry and offered Him all the kingdoms on earth if Jesus would just worship him. Jesus follows Satan’s obnoxious offer filled of such hubris with the simple statement “You shall not put the Lord, your God, to the test” (Luke 4:12). He was tired, hungry, dirty, hungry, lonely. Did I mention hungry? And when Satan offers Him an “easy” way out (easy is in quotes because of all the strings that would be ultimately attached to that bargain), Jesus says a simple “no”. That’s it. No argument, no shouting match, no need for long explanations. Just simply “no”. Jesus’ suffering, His fasting, oh how hard it must have been physically! However, the graces He must have received from His desert experience to have sustained Him for the next three years of ministry. It was challenging at times as I really wanted this to be a private thing between God and myself, so I didn’t tell my family ahead of time. I just started one day and decided to take it one day at a time. The first day was quite difficult as my stomach seemed to be the black whole, wanting to engulf any all food items that came my way. Murphy’s law, right? Or maybe it’s just the idea that you always want what you can't have. But the number of times I thought of eating, thought of having a quick snack, heard my stomach growl (oh yeah that happened! ), I prayed silently to the Lord. Sometimes, I prayed a well thought out beautiful prayer offering my discomfort up in union with our crucified Christ and sometimes I found myself simply saying “Thank You, Jesus”. With each day, came new challenges and my want for food became greater, therefore the sacrifice also became a deeper more full act of love and reparation. In the end I only lasted 3 days (and not in consecutive order) as I’m weak for one thing, and I’m a nursing mama who still needs to keep up my milk supply, so I was a bit worried about that. Pitiful compared to Christ’s 40 days, I know! But there is nothing like the hunger of a nursing mama! This was most definitely a challenge for me. On top of that, it was a beautiful experience and one that I am going to try to incorporate more fully in my Lenten journey. I found myself saying more short prayers throughtout the day, every time I felt hungry or thought about grabbing a snack. I didn't realize how few times throughout the day I actually do pray. This was a bit of an eye opener for me as well. 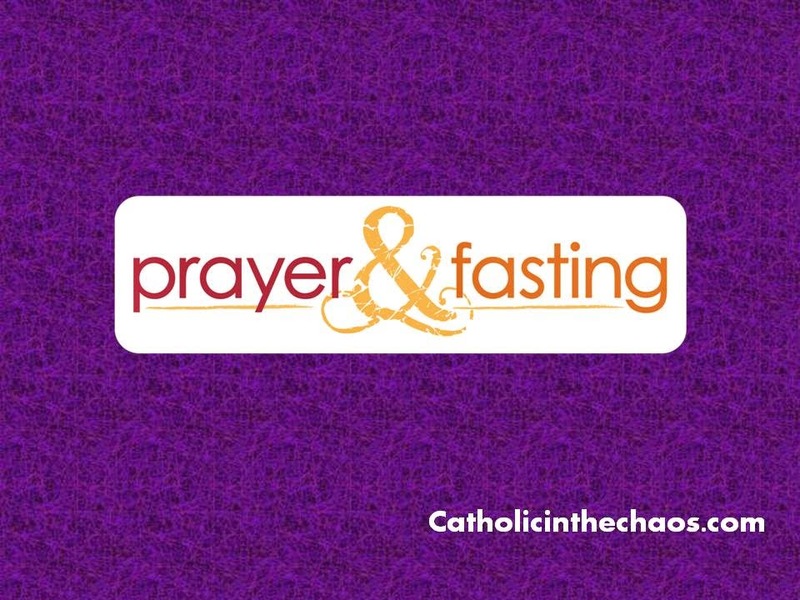 This Lent, I am rediscovering the power and real joy of fasting! Have any plans to make your Lenten experience more Christ-filled? Feel free to share! I'm always looking for some great ideas! I first purchased this book when I joined a group devoted to studying Sr. Faustina's memoirs and praying the Divine Chaplet of Mercy. 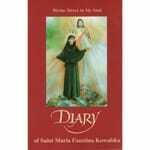 This book is actually a culmination of 5 notebooks Sr. Faustina wrote during her time here on earth. It details her daily life experiences, her sufferings and her joys, as well as the visions of Jesus she experienced. The one thing that really struck me reading and re-reading this book is the physical suffering she endured and still she looked to the cross. Still she offered up her sufferings to be in union with Christ. It's a beautiful, inspiring story of how one little quiet nun's experiences resulted in a world-wide devotion to Christ. A common Catholic tradition for some families is to choose a different patron saint each year to pray to for intercession. As I didn’t grow up with this tradition in my family, it was new to me when I heard of it this past Advent season. So this is the first year my husband and I decided to adopt this tradition with our family. My husband diligently looked up some saints who are no strangers to change, since the theme in our lives this year is all about change. And we chose our family's patron saint of 2015 to be St. Angela Merici, as she seems the perfect fit for us. St. Angela Merici lived in the late 1400s through the mid-1500s. She helped found the Ursuline sisters along with St. Ursula and spent most of her life dedicated to elevating the family by educating girls and mothers. The reason this was so amazing is because in that time, education for females was reserved for the rich or nuns. What a different life she gave so many children from poor families! St. Angela is probably most well known for saying “no” to the pope when he asked her to lead a group of nursing sisters. Instead, she knew deep down in her heart where the Lord was calling her, back to her hometown to continue her life-long passion of educating girls. St. Angela is also reported to have experienced a miracle. On a trip to the holy land she stopped and prayed at a crucifix on the Island of Crete when she went completely blind. Rather than returning home, she continued on her pilgrimage and on her return to Italy, she stopped once again on Crete and prayed at the foot of the same crucifix where it is said that her eye sight was restored. It is believed that this miracle served as her reminder from Christ not to become blind to the needs of others. So why is she the perfect patron saint for our family? Oh for so many reasons. One, St. Angela was not afraid of change and created the change she wanted to see. Our family’s motto is all about change this year. Two, she was a huge proponent of education and a girl after my own heart. I believe in the old adage “knowledge is power”. In addition, this calendar year, we are embarking on our first year of homeschooling, a roller coaster I’m sure I will want to throw myself from many a time over the next 12 months. Ha! Three, St. Angela knew where the Lord was calling her. She never wavered from her purpose in this world. Fourth and finally, she was never blinded to the needs of others. 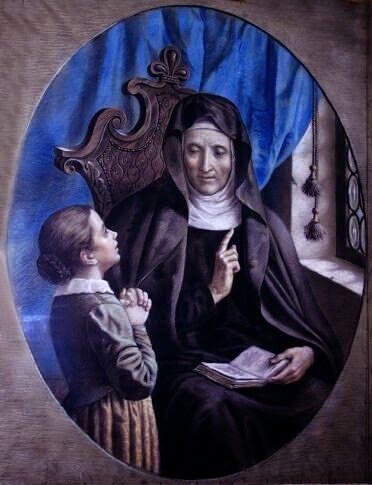 So I pray to St. Angela to help open my heart and mind to the Lord’s call in my life and to help me see what Jesus is asking of me, how I can fulfill the needs of others, in my family, in my community, wherever He is calling me. In my quest to learn more about St. Angel Merici, I found this amazing website, Catholic Playground, offering free downloadable coloring pages for numerous saints. Check it out by clicking on the link above. Did you choose a patron saint for your family this year? Who is it? Comment below! My name is Maria and I'm a wife, mother of two boys (so far, wink, wink), and a Catholic from birth. I fell in love with my religion while in college and re-ignited the flame once I became a mother. So I'm here to share what I learn about myself and my vocation as wife and mother, through much trial and error, as well as what I am learning (or relearning) about our amazing religion. Book Review: The Chapel Veil! My Journey Veiling at Mass: Part 1!